Good news that another new small wine merchant has appeared on my radar, trading online, and with an interesting take on things. The Vino Beano is run by Robert Edwards, who like quite a few before him has taken his passion for wine and turned it into his profession, launching The Vino Beano in July 2016. Buyer and Wine Consultant for the business is MW Robin Kick, who works from her home in Lugano in Switzerland, handily placed for visiting many key northern European wine regions. The company says that “Vigorous research and extensive global tours across wine regions have unearthed undiscovered hidden gems from producers which haven’t yet hit the mainstream,” and I was sent two examples that do fit that bill, neither producer being familiar to me. 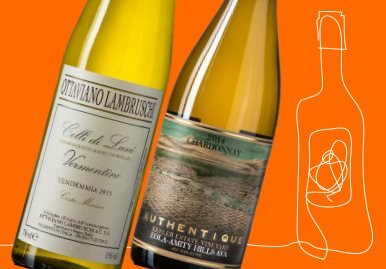 But to show diversity, one is a very ‘New World’ Chardonnay from the USA, the other a northern Italian white of classical proportions. The web site certainly inspires confidence, with very extensive notes – not just a sales pitch – for every wine. A wine trading exchange is also being added, as well as a free membership club promising priority access to special deals, and even wine tours, on which you can join Robin Kick for an itinerary of estate visits and dinners. (2017) Interestingly enough I tasted this wine within days of recommending a Provence white wine made from the same grape variety, Vermentino, though in Provence it is generally known as 'Rolle'. The two wines have plenty of similarly in terms of basic style and aroma and flavour profile too, both having some lees ageing to add a bit of meally richness and texture, but like the Provence example this has a dazzling freshness on the palate, the fullness of flavour offset by a touch of bitter almond and plenty of apple bite to the acidity. Another excellent wine. (2017) A Chardonnay from the hillsides of Amity and Eola in Oregon, made using biodynamically-grown grapes. It is barrel-fermented with indigenous and commercial yeasts, and spends 18 months in medium-toast and neutral French oak barrels, of which 40% are new. The toast, spice and cappuccino of the oak marks the nose in a fairly ostentatiously 'serious' wine (big, heavy bottle, wax-sealed cork), but the palate freshens up very nicely, the toast and touch of marmalade still there, but there's a good acid structure and medium-bodied appeal, dry and pithy lemon and grapefruit cutting through any hint of richer fruit flavour. Long, intense and powerful, it matched well with roast chicken.